Top row: "Stories in Cloth" at the Textile Center of Minneapolis. 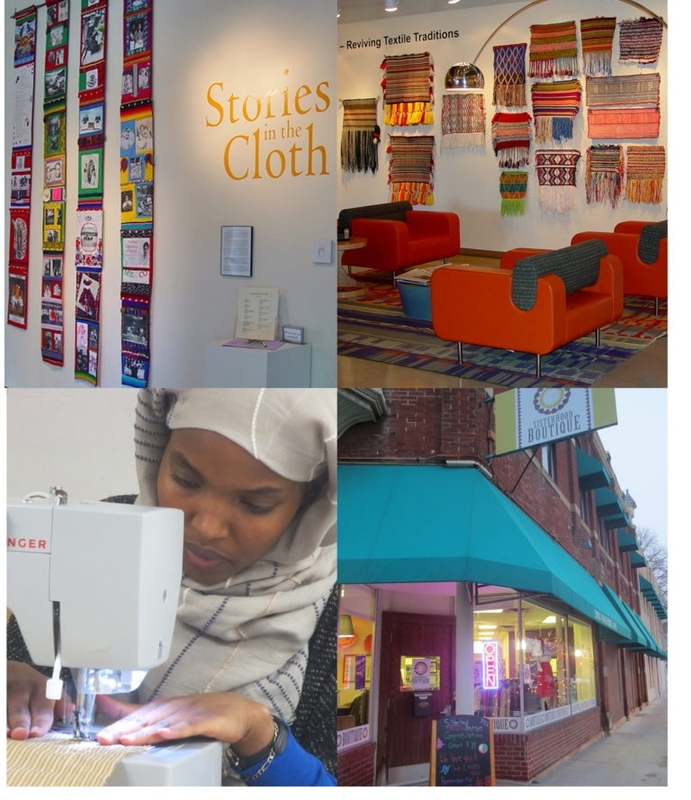 "From Somalia to Minnesota--Reviving Textile Traditions" at the McKnight Foundation. Bottom row: Sewing classes at the Sisterhood of the Traveling Scarf in the Cedar Riverside neighborhood of Minneapolis, MN. Art is a common thread that brings members of diverse communities together. It unites people, heals pain, stimulates dialogue, and nurtures mutual understanding. My cross-cultural journey spans almost five decades. I’ve worked with African Americans, Native Americans, Hmong, Latinos, and East Africans. I’ve had opportunities to teach sewing classes, curate textile exhibitions, and facilitate cross-cultures events. One of the most exciting was an exhibition at The Textile Center of Minnesota combining the work of three communities—Hmong, East African, and Latino. Small groups of women (10 to 25 women in each group) worked in their own communities and then came together to create an exhibition of their culturally-inspired works. A second amazing experience was an exhibition of the weavings of elder Somali women at the McKnight Foundation. 50+ weavings hung in the lobby of the Foundation. The opening at McKnight featured traditional food prepared by women from the East African Women’s Center for 300 guests from diverse communities. Until recently, I had the opportunity to volunteer at the Sisterhood of the Traveling Scarf, teaching sewing and some fiber techniques to young East African women.